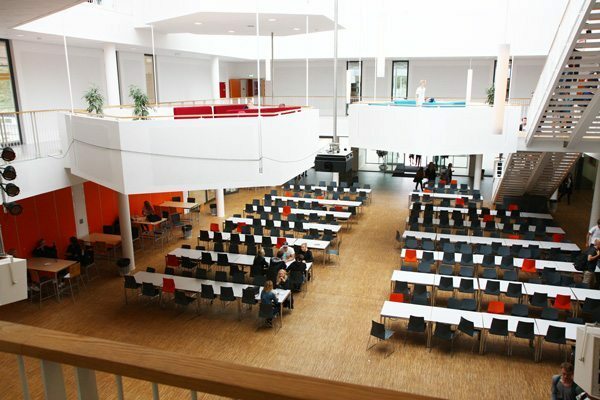 In several schools, the cafeteria is only used for breaks and the rest of the day, they are expensive unused square meters. 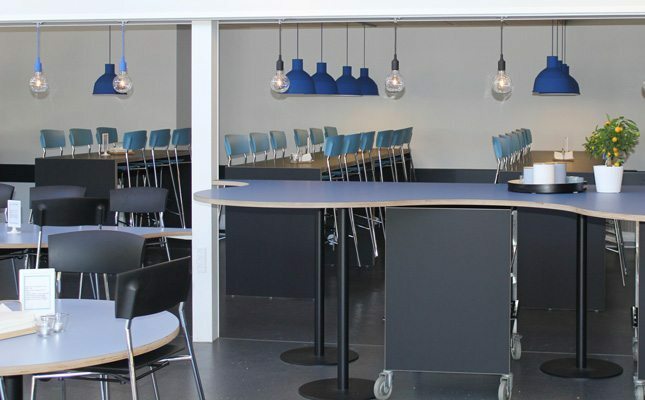 Sections can be created within the cafeteria with different lighting and interior design solutions that can both accommodate social dining and group work. 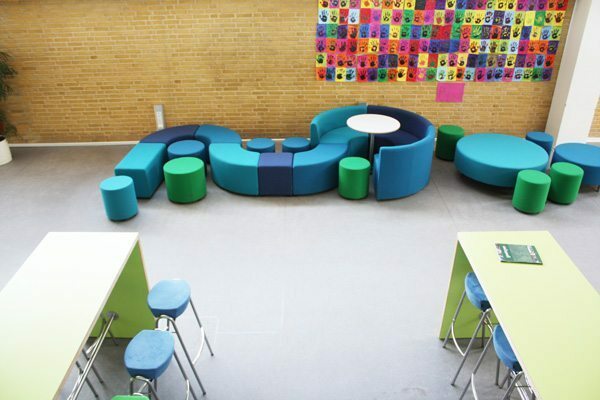 By furnishing the cafeteria with different types of furniture, multiple functionalities can be added to the room. Long tables create a quiet atmosphere to enjoy lunch, while softer furniture creates a relaxed mood. 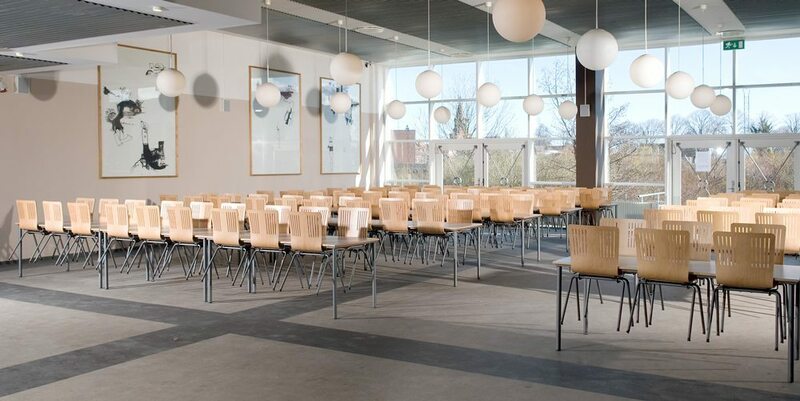 In the cafeteria environment, there is often a need to reduce noise from plates and cutlery and loud conversation. This can be accomplished by using Højer Møbler’s noise dampening MUTE tabletop. It could also be done with the use of high tables, for reducing the height to the ceiling and thus creating a more intimate experience. A dimmed lighting solution can also get people to talk at lower volumes in an area. Atrium hall, which doubles as a cafeteria and a venue for various events. FourCast stacking chair in a simple expression combined with Howe’s Simpla folding table, where a high ergonomics is achieved during teardown and setup because tabletop and frame are separable, making it easy for one person to handle. 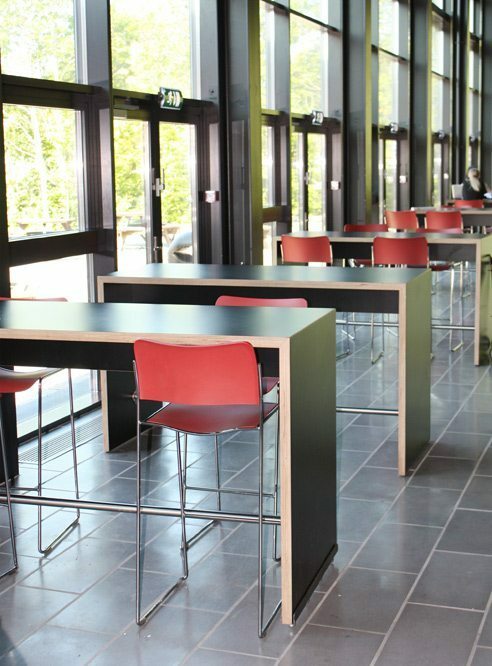 In cooperation with Howe, the Simpla table in this environment is equipped with Højer Møbler’s MUTE acoustic table top to limit interaction noise. The noise is significantly reduced, in particular during eating situations. 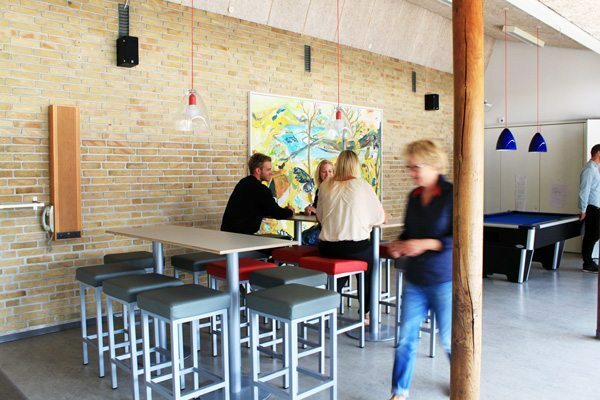 B-Bitz lounge from Johanson Design in modular construction provides flexibility and changes the room by favoring both open and closed environments. Combined with tall gable table, it provides an interior where several levels in the room can be used, effectively making it a “multiroom”. The organic design of the lounge furniture creates a contrast to the stringent design of the gable tables and barstoolse. Classic cafeteria decor, where small group social dynamics are in focus. Smaller tables on columns provides the opportunity to change the setup of the room or completely relocate all the furniture, to make room for activities. 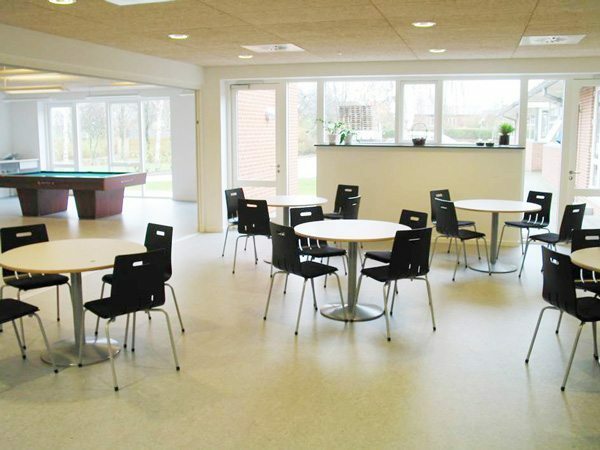 Traditional cafeteria solution, with a focus on comfort and longevity, whether it is in regards to cleaners or diners. The flowing seat of the Elegance chair provides less pressure on thighs. In this case, the chairs can be suspended from beneath the tabletops, so that cleaning is made easier. Our table for concentrated work, Focus, is the centerpiece of this room. 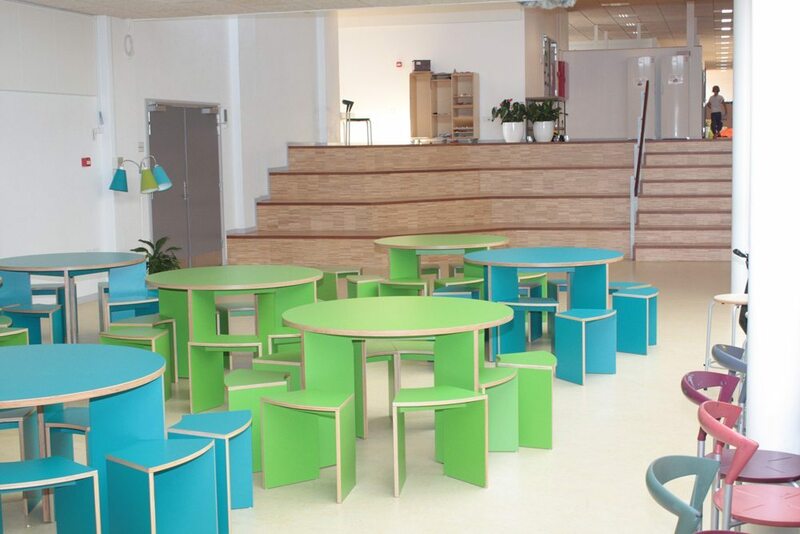 Around on both sides of Focus is gable tables and the whole setup can be categorized as a mega furniture. It supports diverse types of work and the possibility for shielding for 4 persons inside the Focus. It can be upgraded with noise dampening panels and lighting, and comes in both standing and sitting height. As a chair for the gable tables, Nova barstools was selected – its high back support makes it an ergonomic and aesthetic choice to complement the Focus furntiure. Stylish decor with classic furniture including David Rowlands 40/4 chair produced for more than 8 million units since its launch in 1964. The chair has outstanding ergonomics as well as one of the markets easiest chairs to stack. Simply distinctive colors brings life to the room, but does not interfere with the pure classical expression. 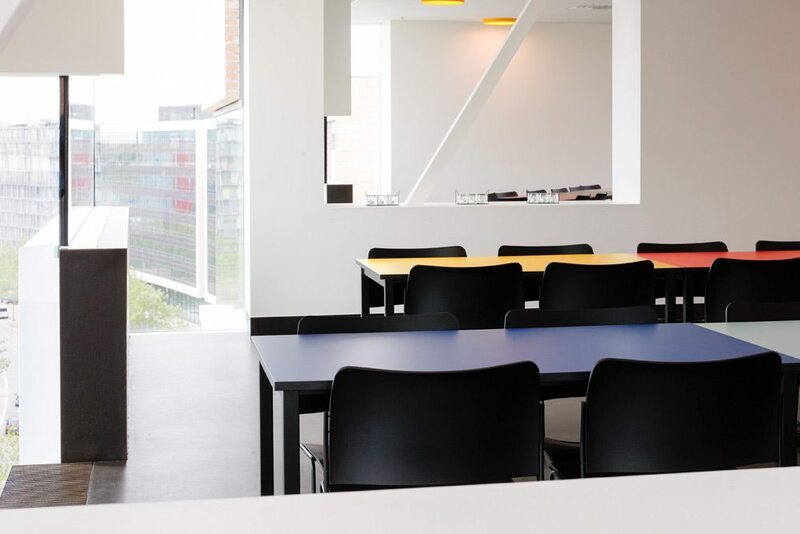 Combination of high and low seating gives the room good dynamics complimented by the 40/4 chair’s stunning stacking capabilities and with folding frames, the room can quickly be de-furnished and adapted to changing usage patterns. 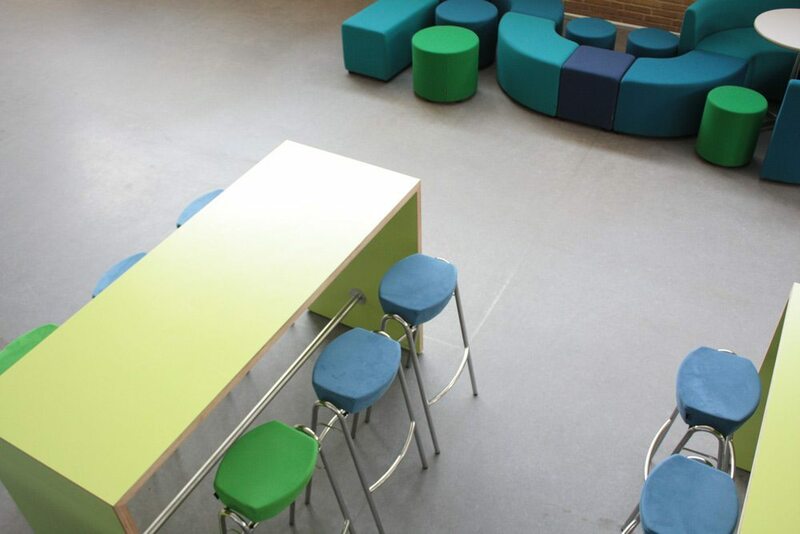 4-piece cafeteria table in 4 different laminate colors provides a exciting visual expression, as well as an excellent surface on tables, which suffers heavy use by the hand of students every day. Despite this it is easy to keep clean and does not require maintenance. 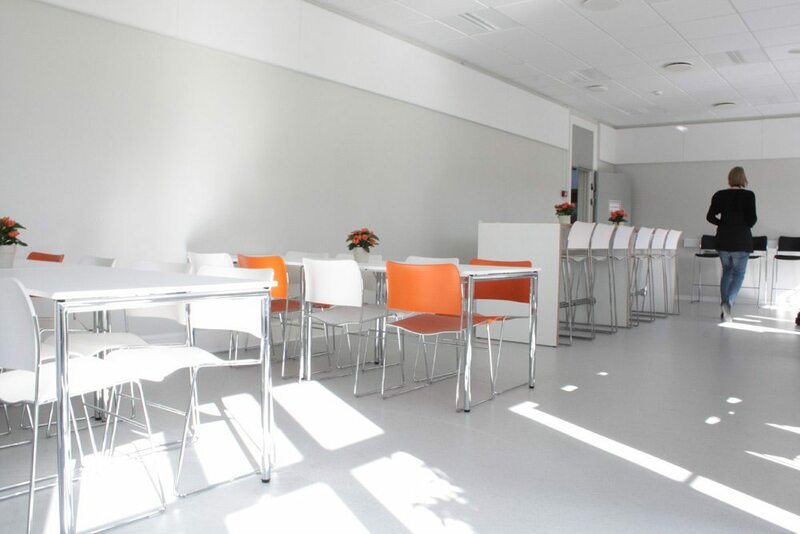 The classic style of the 40/4 chairs and high-seat ergonomics make it a great choice for cafeteria and multirooms. Multifunctional decor with high stools by columned tables provides an informal atmosphere and flexibility in the room, because the furniture is easy to move. 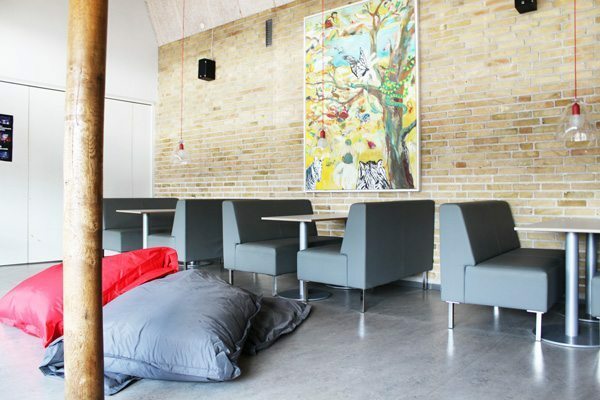 To create a more relaxed and quiet experience, U-Sit lounge was used in a typical diner setup, front-to-front combined with beanbags, it ensures that the room can be used dynamically and in many different ways. 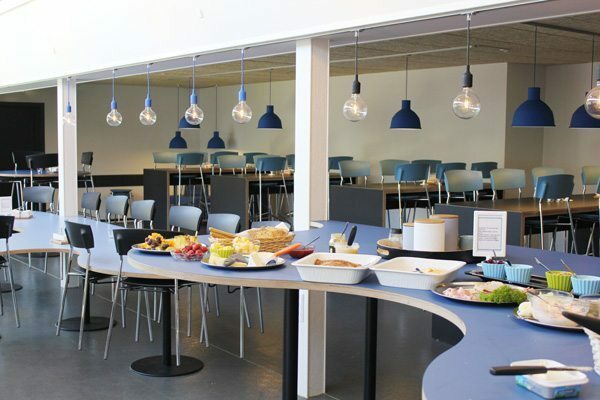 The school had a wish for an untraditional and exciting cafeteria solution, where different sceneries should work with both eating, group work and talking to large groups. The solution was organically designed tables on columns in sitting and standing height, combined with high gable tables og PURE chairs in normal and barstool height.